Description: To 137cm long. Robust, somewhat flattened body. Notable broad, brown head with dark eyestripes, a “V” marking on top of the head and an inverted “V” on the snout. Has keeled scales. Body is dark brown to black with narrow light bands that fade in old age. Underside is white to yellow with small black dots. 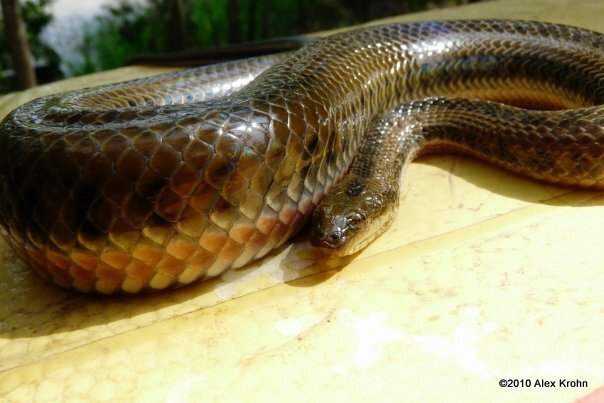 Similar Species: Bocourt’s Water Snake has no face mask, is thicker and darker with black markings interspersed with the brown. Red-tailed Pipe Snake has a small, dark head, smooth scales, and a barred underbelly. Habitat: Rivers, lakes, ponds, swamps, rice paddies, drainage ditches, and any other lowland habitat with water, including brackish water. Can be found in the water or on the banks. During the day it hides in burrows and crab holes. Contribution to the ecosystem: Jack’s Water Snake eats fish, crustaceans, and frogs. Juveniles of the species are eaten by larger snakes, large fish, monitors, and wading birds. Danger to humans: Can bite, but rarely does so and is not dangerous to humans. Conservation status and threats: Due to its broad distribution and ability to live in human-altered habitats, this snake is not considered at risk in Thailand. It is becoming popular in the pet trade, but that has only had an effect on populations at the local level. In nearby countries similar species are declining due to massive collection for food, skins and crocodile feed. 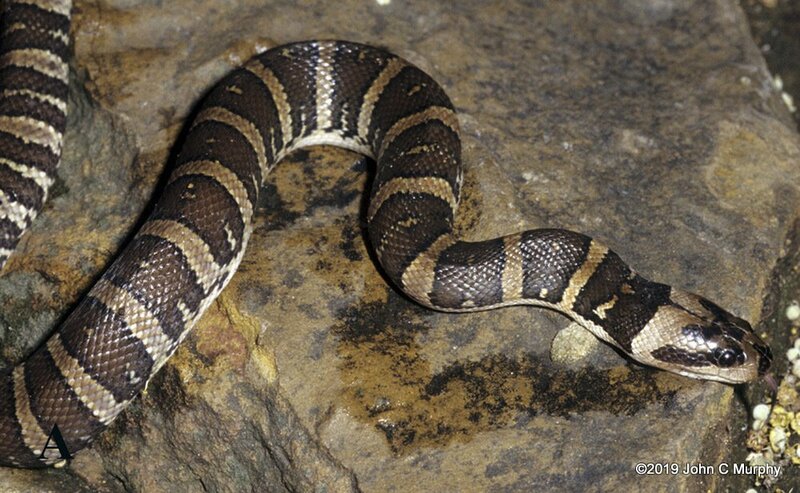 Interesting facts: In September 2010, I came upon a juvenile Jack’s Water Snake in Lumpani Park. Upon viewing and photographing the snake, an American tourist nearby got anxious and stated, “I ask only that you do not harm the snake.” Further inquiry found that he had bought the snake at a Bangkok market and “humanely” released it into the Lumpani Park lakes. He had no idea whether the snake was a native species or whether it was venomous. Releasing a captive animal into the wild, even a native one, is not good for the local ecosystems. Non-native species, such as the red-eared sliders in the ponds, the Norway rats in the streets, and the English house sparrows in the trees, may prey on, outcompete, or spread disease among local species. And even native species that have spent time in captivity are highly at risk for transmitting disease into the wild populations. If you purchase a captive animal and can no longer care for it, please find a responsible person to take over care for the animal rather than releasing it into the wild. Description: To 90cm long. Body is slender and flattened. 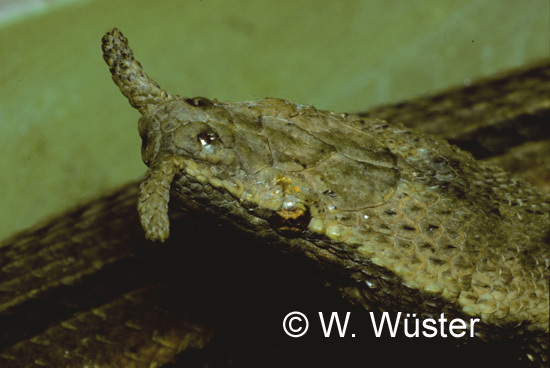 Head is trapezoid-shaped and has two short “tentacles” that protrude from either side of its snout. Tail is prehensile. Body color can be gray to brown, with different color phases including widely separated short dark bands, much broader dark bands with little separation, or longitudinal stripes. Head has a reddish-brown stripe on each side that runs from the appendage to the eye. Belly is yellowish-brown. 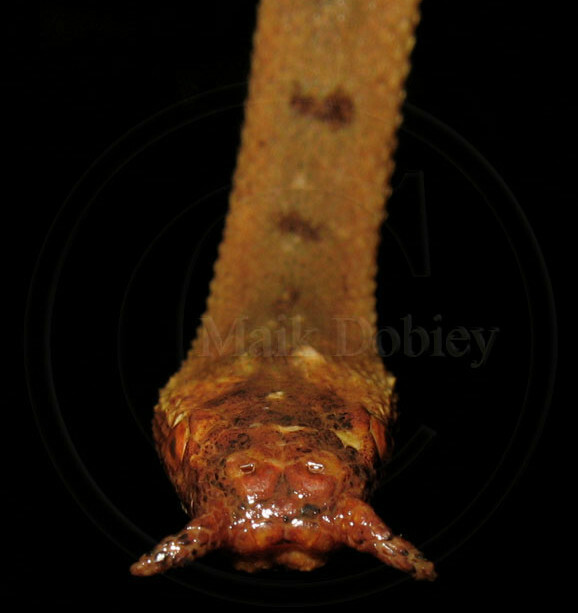 Similar Species: The Tentacled Snake is the only snake in the world with a pair of protruding appendages on its snout. 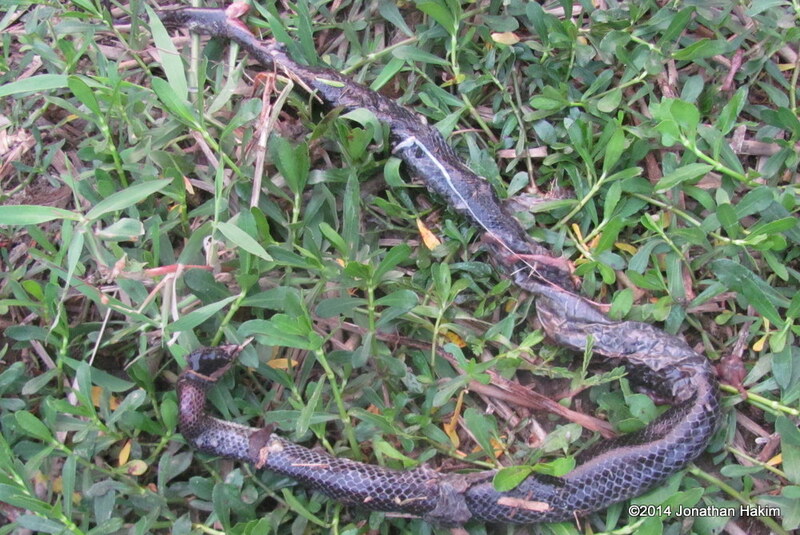 It is also more slender and flattened than the other water snakes in our area. Habitat: Found in stagnant lakes, streams, and rice paddies, in areas with murky water and vegetation. Can live in fresh, brackish, or sea water. May burrow into mud during dry periods, but otherwise is not found on land. Place in the ecosystem: Eats fish and occasionally shrimp. Fed on by larger snakes, large fish, monitors, and wading birds. Danger to humans: Rarely bites. Is a rear-fanged snake, but it has a weak, fish-specific venom and is of no danger to humans. Conservation status and threats: The Tentacled Snake is common in its range, though there is some harvest for its meat. 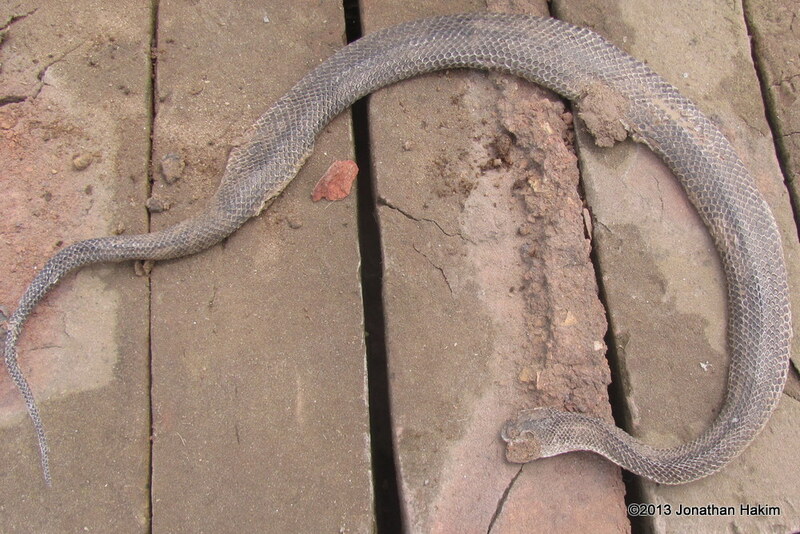 Like other water snakes it potentially faces declines in the Tonle Sap Lake due to the extensive snake harvest there. Interesting facts: The Tentacled Snake has one of the most fascinating hunting techniques in the snake world. It ambushes its prey by waiting in a “J” position, with its tail anchoring its body to vegetation and its head curved back towards its body. 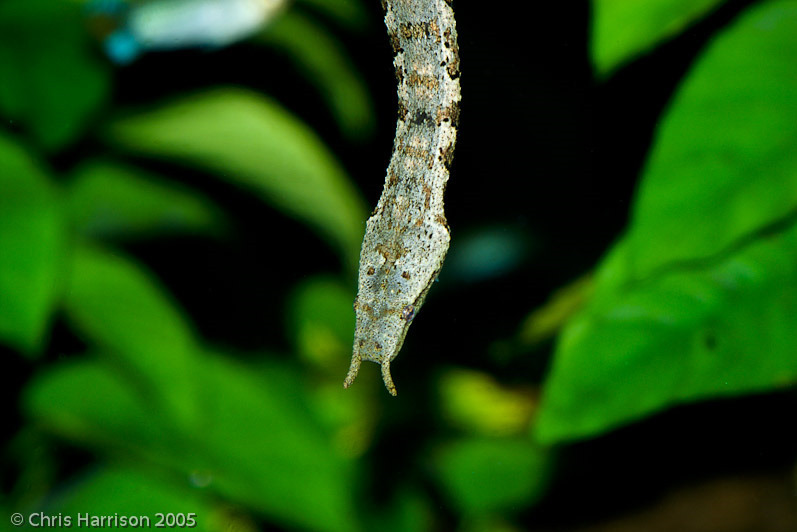 When a fish swims nearby, the appendages on the snake’s head sense the fish’s movements via disturbances in the water. Once the fish gets close the snake moves part of its body behind the neck, creating a reflex movement in the fish. The snake immediately strikes with its head exactly where it anticipates the fish’s reflex movement to direct it. This is the only snake that is known to induce a flight response in its prey and strike where it anticipates the prey to be going, rather than aiming at its current location. Watch these videos to see the Tentacled Snake in action. Description: To 77cm long. 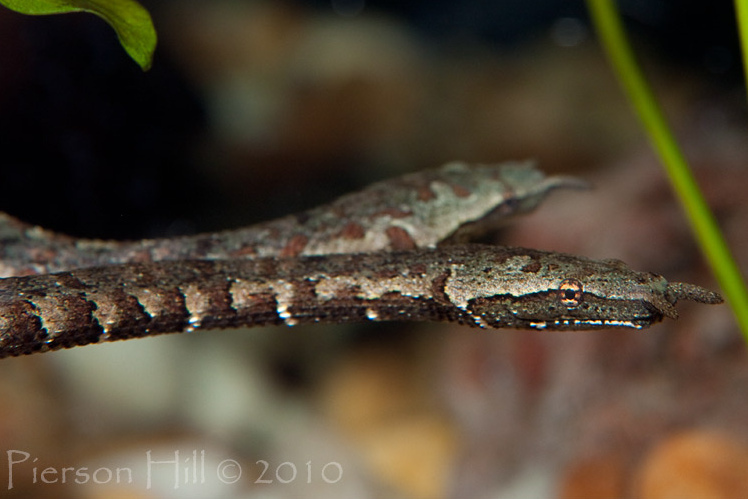 This small water snake has a moderately broad head and smooth scales. It is uniformly dark above with a pale cream to yellow underbelly. 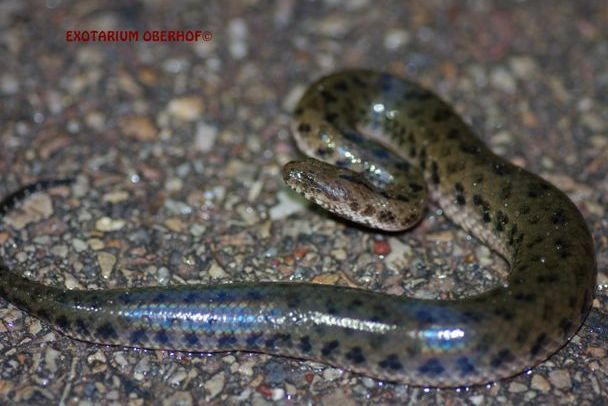 Similar Species: Rainbow Water Snake has a smaller head and colored lines going down its body. Jagor’s Water Snake has small dark blotches down its sides. Chanard’s Mud Snake has a pale line down its side and a row of small dark dots above the line. Sunbeam Snake is iridescent, has a narrow wedge-shaped head, and is whitish-gray on the bottom. Red-tailed Pipe Snake has a small head and a barred underbelly. Yellow-striped Caecilian lacks scales, has yellow stripes on the side rather than a yellow belly, and has a distinctly non-snake-like head. Habitat: Slow-moving rivers, ponds, swamps, rice paddies, and other wetland habitats with stagnant water. Forages from dusk until dawn. Found on land more often than other water snakes, but rarely far from the water. Place in the ecosystem: Feeds on fish and frogs. Eaten by larger snakes, large fish, monitors, and wading birds. 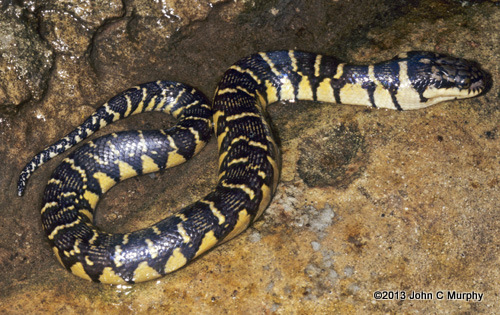 Danger to humans: The Yellow-bellied Water Snake will aggressively strike when cornered on land, but its small size keeps it from being able to inflict much damage. 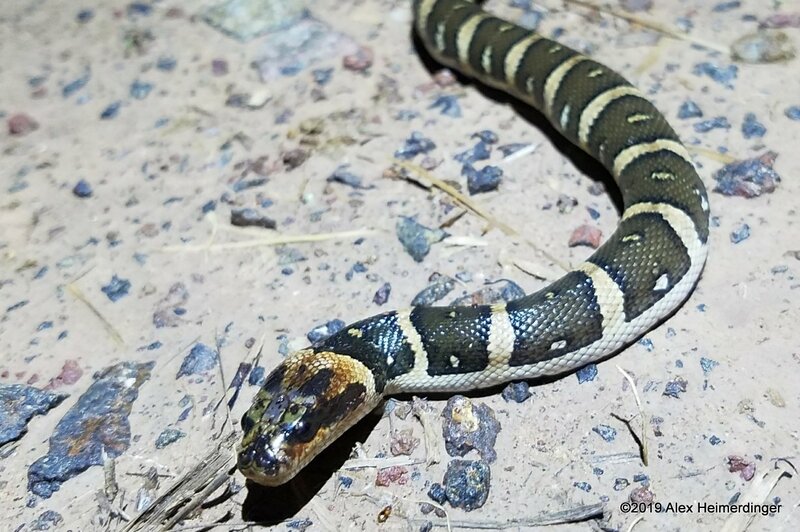 While it is a rear-fanged snake with some venom, the venom has a limited effect on humans, possibly leading to some swelling in the worst cases. Conservation status and threats: No known conservation issues. This is a common species in Thailand, though its population in Taiwan is endangered. 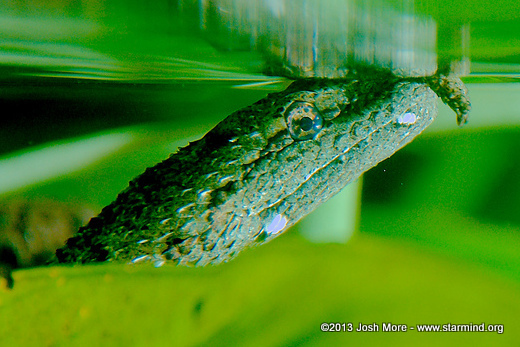 Interesting facts: Yellow-bellied Water Snakes are excellent swimmers but move awkwardly on land. When faced with a threat on land, they will sometimes flip their bodies up into the air and backwards with a reverse-striking motion, propelling themselves erratically towards the water. Description: To 68cm long. A short, thick snake. Head is short and rounded. Body is grayish-brown to dark brown with black blotches in a line down the sides. Underbelly is pale. Similar Species: Chanard’s Mud Snake has a pale line below a row of small dark spots rather than larger dark blotches. 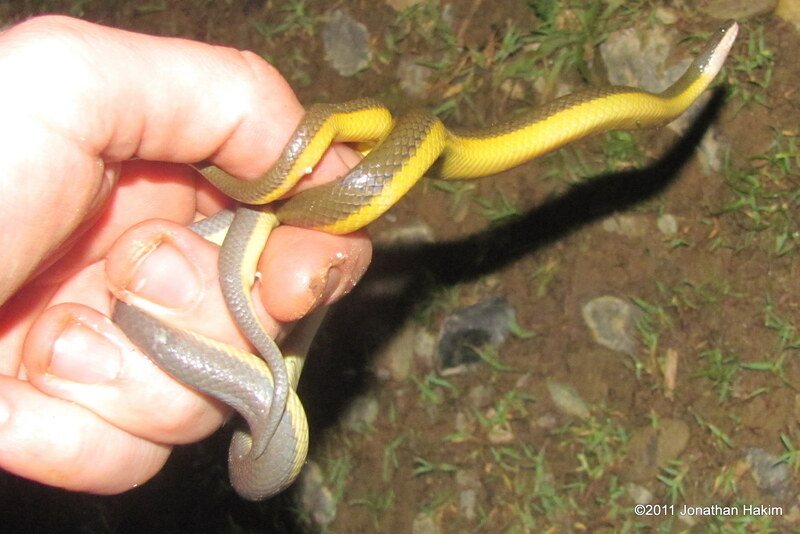 Yellow-bellied Water Snake is uniformly dark above with no spots. 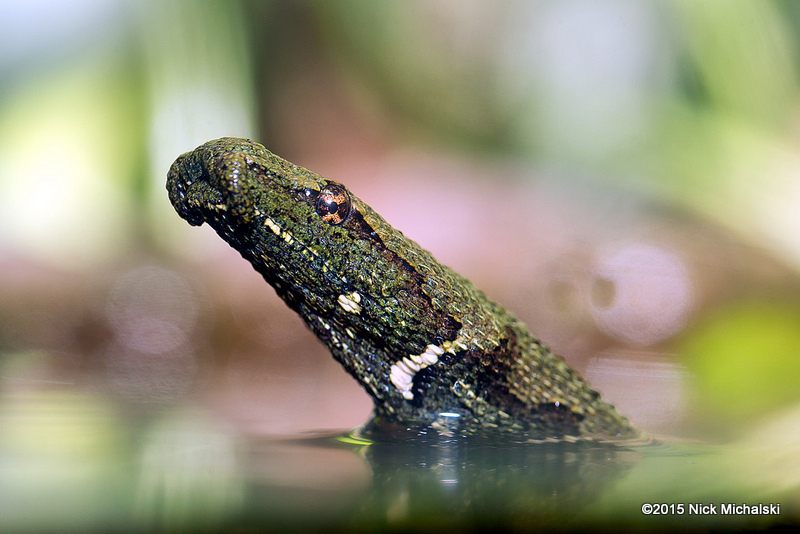 Puff-faced Water Snake is lighter in color with a light barred pattern on body and dark mask on the face. Rainbow Water Snake has a smaller head and light stripes rather than dark spots. Bocourt’s Water Snake is much larger and has narrow yellow banding on black/brown background coloration. 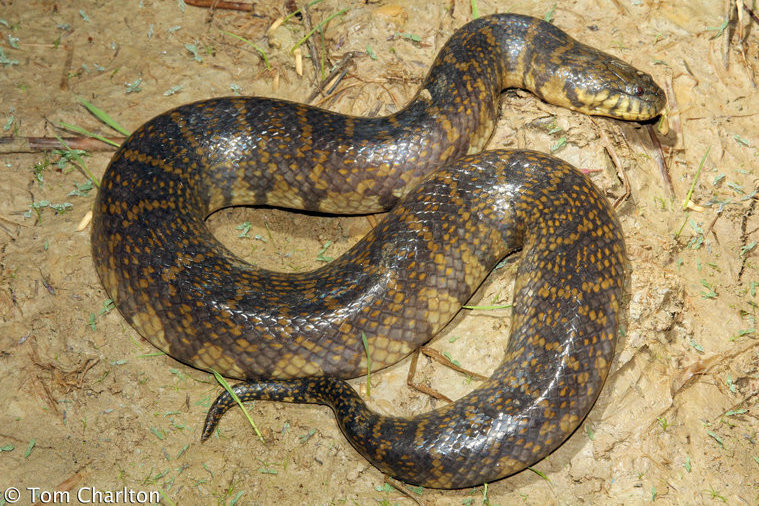 Tay Minh Water Snake is similar to Jagor’s Water Snake, but is only found in the Mekong Delta. Habitat: Found in floodplains, freshwater swamps and shallow marshes, including artificial wetlands and rice paddies. Place in the ecosystem: Eats fish and frogs. Is eaten by larger snakes, large fish, monitors, and wading birds. Danger to humans: Is an aggressive rear-fanged species and will bite when threatened but is not dangerous to humans. Conservation status and threats: This species may only be found in the Central Plain, and in fact only one population is currently known to persist. It is locally abundant there, but human encroachment and the possible draining or pollution of its wetlands are a threat to its current habitat and thus its continued existence. Interesting facts: References to the current distribution of Jagor’s Water Snake vary widely. Some sources state that it is only found in a single location in Thailand’s Central Plain, others state that it is found broadly in the Central Plain and Southeastern Basin, and still others state that it is a wide-ranging species that can be found in most of Thailand and beyond. Why the discrepancy? It’s likely due to taxonomic confusion. New species are discovered every year in Thailand, and often what was previously thought to a be a single species turns out to be 2, 3, or even 10 or more different species. At the same time, different species discovered in different areas sometimes turn out to have been the same species all along. As these things get sorted out, different references will update their records at different times (or sometimes even refuse to accept the same explanation), and thus such discrepancies arise. 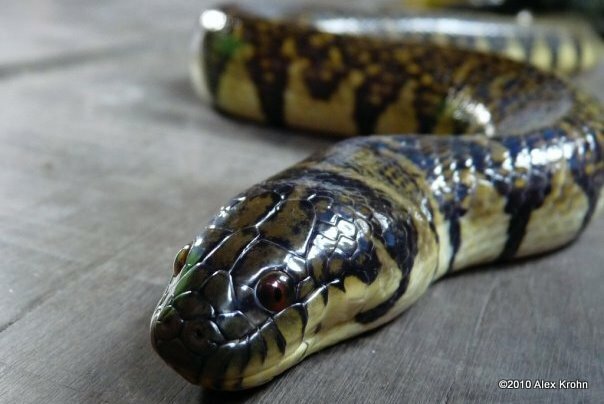 In this case, the problem is likely that the Tay Minh Water Snake and Mekong Mud Snake are species of water snake which are extremely similar to Jagor’s Water Snake, but are found in other areas. The Tay Minh Water Snake is found only in the Mekong Delta, while the Mekong Mud Snake is only found in Tonlé Sap Lake, Cambodia. Jagor’s Water Snake has also been confused with Chanard’s Mud Snake. Most of the records of Jagor’s Water Snake from outside the Central Plain are probably the result of confusion with another species. Description: To 97cm long. 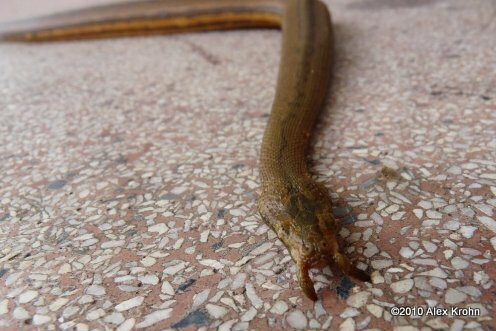 Robust body with relatively small head for a water snake. Scales are smooth and iridescent. Olive-brown above with two yellow or reddish stripes bordered by dark stripes on the top and sides. White to yellow below with a dark stripe or dots down the center of belly. 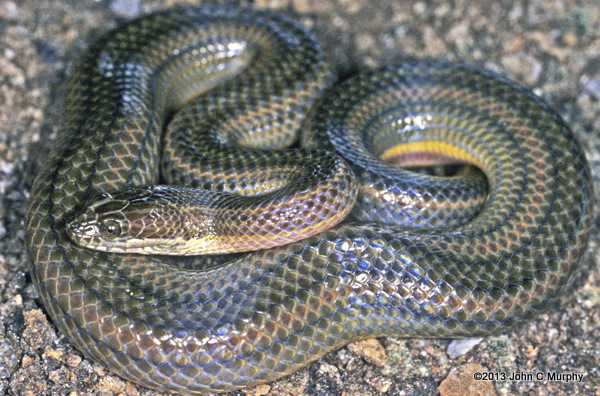 Similar Species: Yellow-bellied Water Snake has a broader head and lacks colored lines. 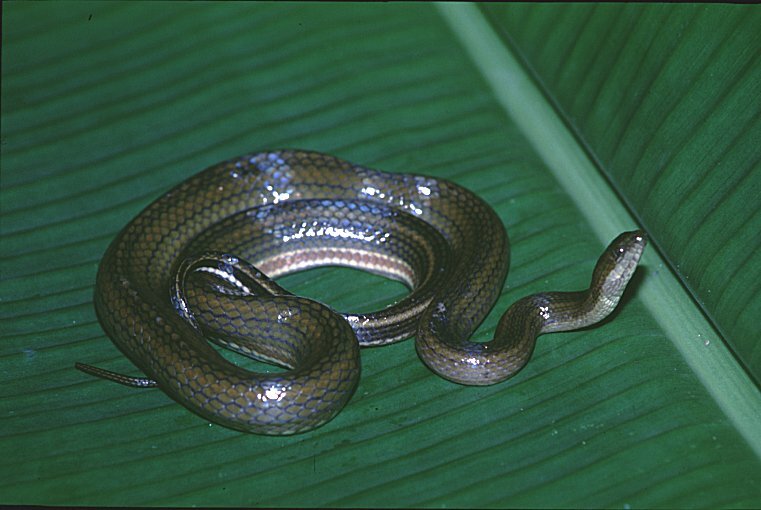 Sunbeam Snake has a wedge-shaped head, more iridescent scales, and lacks colored lines on its body. Red-tailed Pipe Snake lacks colored lines and has a barred underbelly. Chanard’s Mud Snake has a broader head and dark spots above the line running down its side. Jagor’s Water Snake has a broader head and dark blotches running down its side. Habitat: A highly aquatic species that is always found in or near wetlands. Is found in a wide range of aquatic habitats, including manmade lakes and ponds. Spends most of its time hunting just off the shore, taking advantage of the tangles of vegetation in the mud at the water’s edge. Is rarely seen in the open, preferring to remain underwater or within vegetation mats and tangles. Does not tolerate brackish water. Place in the ecosystem: Primarily feeds on fish, but also frogs and tadpoles. Is eaten by larger snakes, large fish, monitors, and wading birds. Danger to humans: Like other water snakes in its family, the Rainbow Water Snake has a very mild rear-fanged venom that does not pose a threat to humans. Conservation status and threats: Due to its ability to survive in a wide range of habitats and tolerate human encroachment, the Rainbow Water Snake is a common species in Thailand. 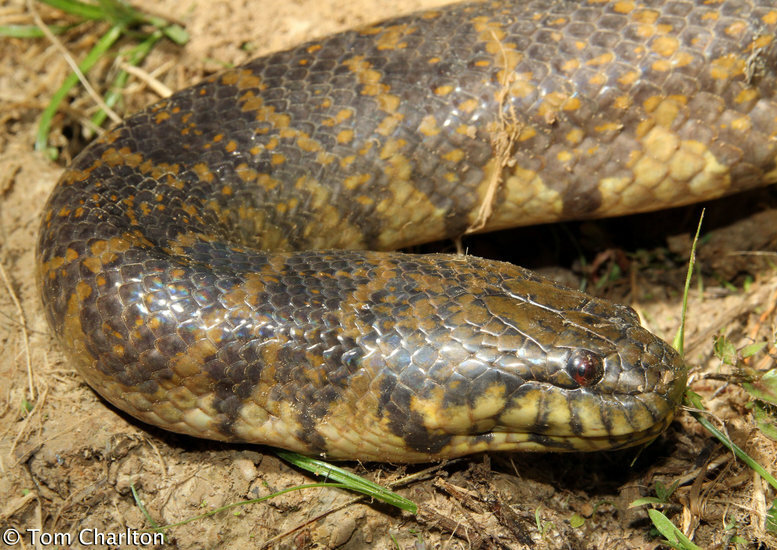 However, a recent increase in the harvest of water snakes in Cambodia (for food, skins, and crocodile feed) has led to declines in some populations there. As many as four million Rainbow Water Snakes are estimated to be captured from the Tonle Sap Lake every year. 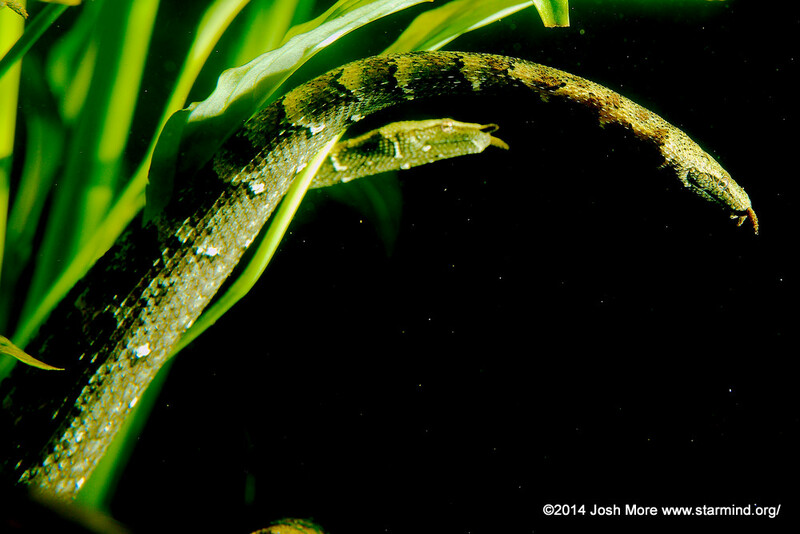 Interesting facts: Water snakes have a number of specialized traits to support their aquatic lifestyle. These include eyes positioned on top of the head (to see prey and threats while remaining underwater), nostrils that can be closed while underwater, and young that are born live (eliminating the need for a dry place to lay eggs). Description: To 55cm long. A very short, thick water snake. Head is broad and mottled with yellow and grayish-brown coloration. Body is grayish-brown above. There is a pale stripe on each side with a row of small dark dots running just above it. Underbelly is pale with a grayish zig-zag line on the edges. 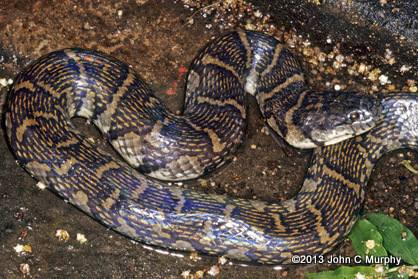 Similar Species: Jagor’s Water Snake lacks the yellow stripe and has large dark blotches rather than small dark dots. 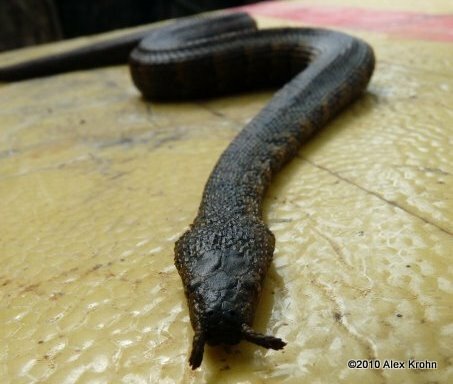 Yellow-bellied Water Snake is uniformly dark above with no spots or lines. 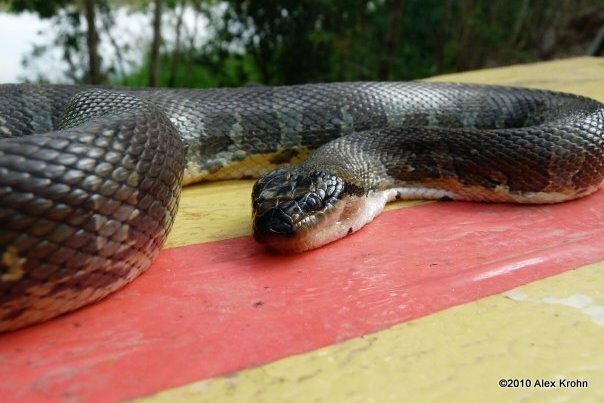 Puff-faced Water Snake is longer, has a light barred pattern and dark mask on face. 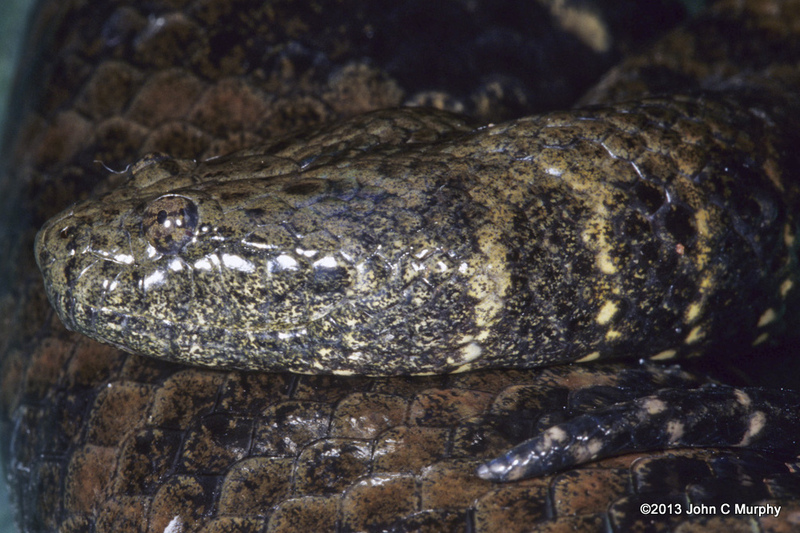 Bocourt’s Water Snake is larger with dark brown-and-black areas broken up by narrow light bands. 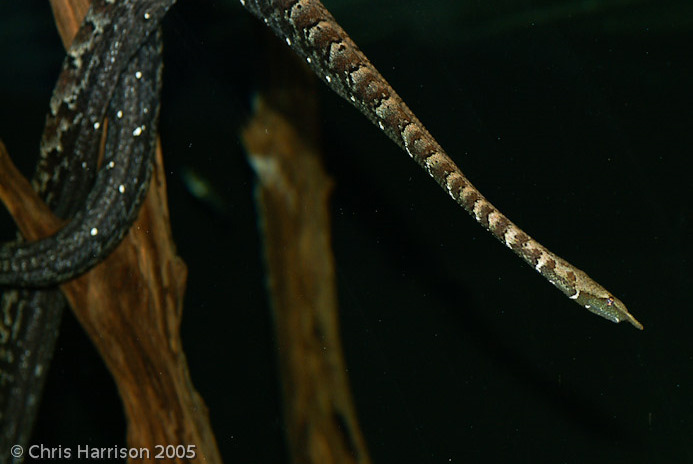 Habitat: This snake is found in freshwater environments in the Chao Phraya drainage, including artificial water bodies. Like other members of its family, it likely spends nearly all of its time in the water. Place in the ecosystem: Living populations have not yet been studied, but it likely feeds on fish and frogs. Would be eaten by larger snakes, large fish, monitors, and wading birds. Danger to humans: Is a rear-fanged snake like other members of its family, but is not dangerous to humans. Conservation status and threats: This species was recently described from 15 museum specimens, all of which came from Metropolitan Bangkok or the surrounding area. The most recent of these records was about 20 years old. There are concerns that development in Bangkok may have destroyed much of its habitat and it may be extinct in Bangkok. 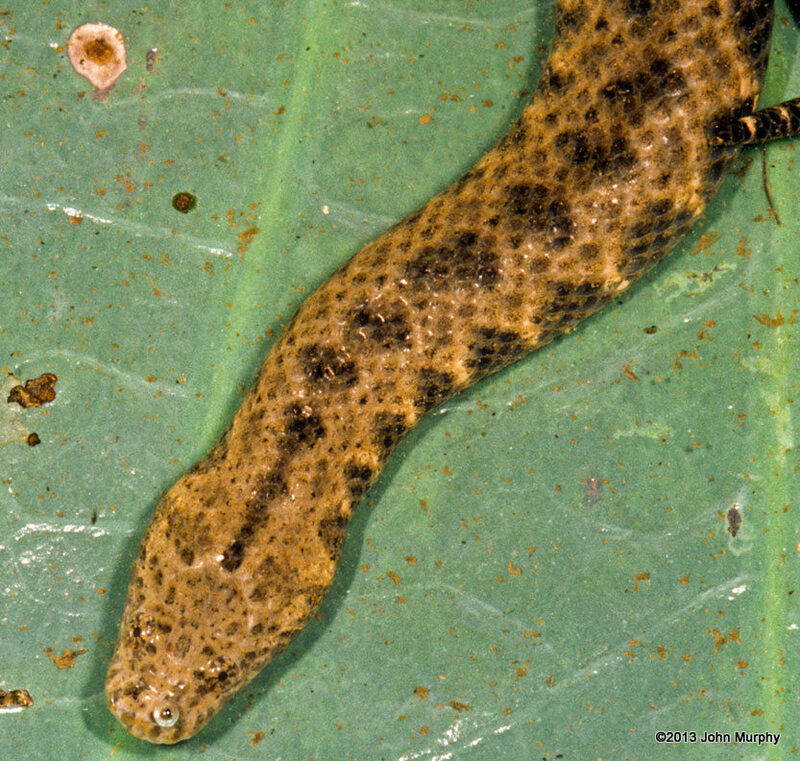 The above photograph from Nakhon Nayok Province represents the most recently seen living specimen. Interesting facts: New species are not always found out in the wild. This species was discovered in 2005 by two biologists who examined Jagor’s Water Snake specimens from many museums and discovered that a number of the records were actually mislabeled and represented a previously unknown species. The species was described from these museum specimens, the most recent of which was nearly twenty years old and some of which had been collected a hundred years earlier. 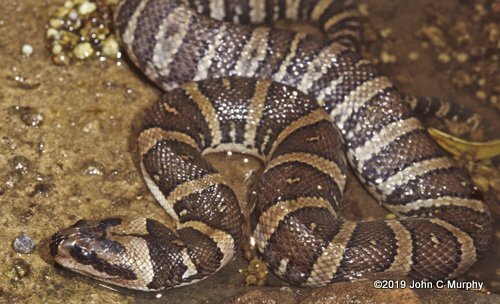 Unfortunately, the Chanard’s Mud Snake might be gone almost as soon as it was discovered. Nearly all of the museum specimens of the species come from Bangkok, which is a tough place for water snakes to live due to its high degree of development. 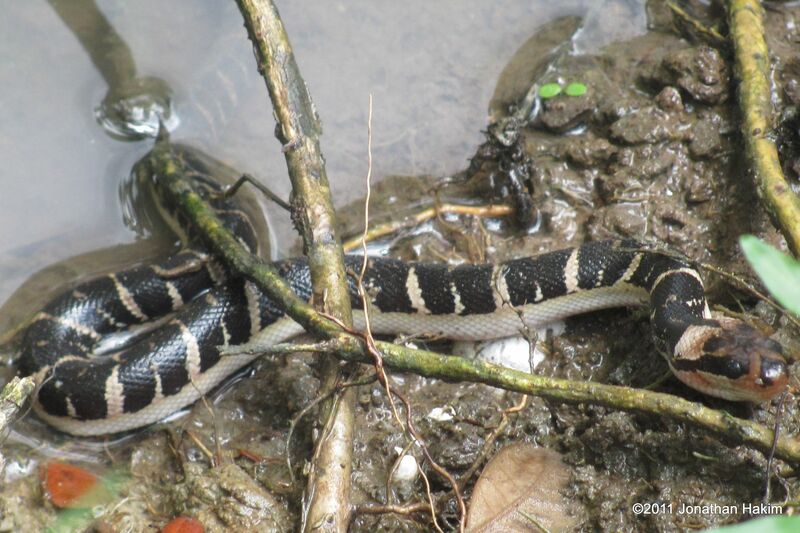 It is possible that some Chanard’s Mud Snakes persist in Bangkok, but it will be tough for them to hold on. Hopefully the more rural surrounding provinces have enough of the species in less developed areas that it will be able to survive. Description: To 110cm long. 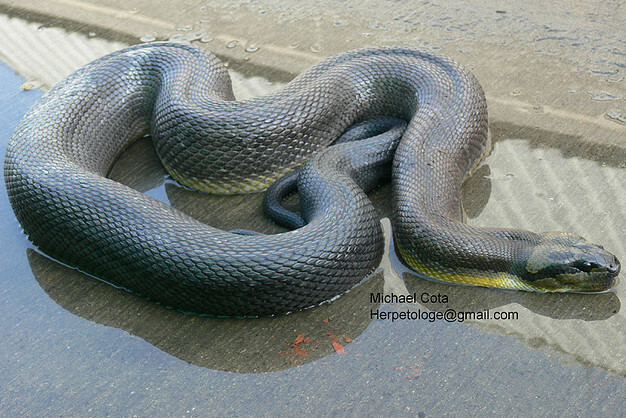 The largest, most robust of the water snakes in Thailand. Head is large and blunt. The smooth-scaled body has large brown blotches/bands with black borders that narrow on the sides, with yellow bands in-between that broaden correspondingly. Brown areas sometimes have thin tan-to-orange line in the center. Both the light and dark coloration becomes more indistinct as the snake ages. Head is reddish-brown with a cream upper lip and red eyes. Underbelly is yellowish-white. 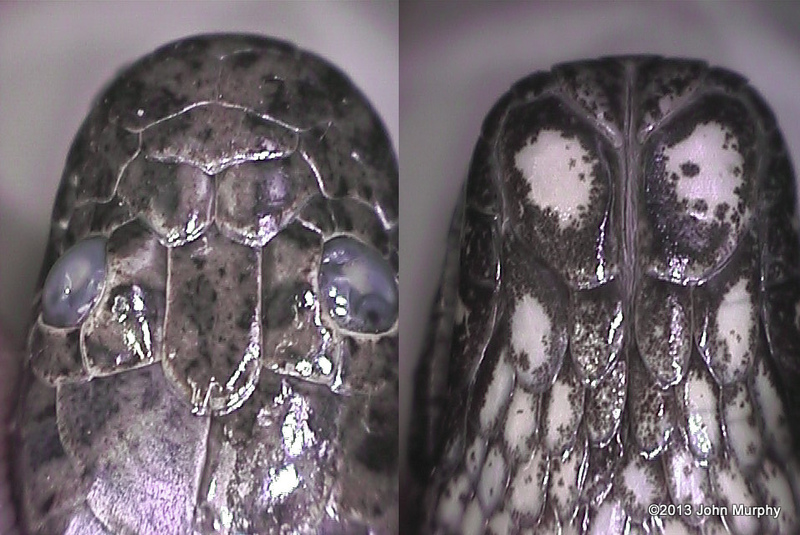 Similar Species: Puff-faced Water Snake has keeled dorsal scales, is usually not as robust is lighter in color, and has a distinct dark face mask. 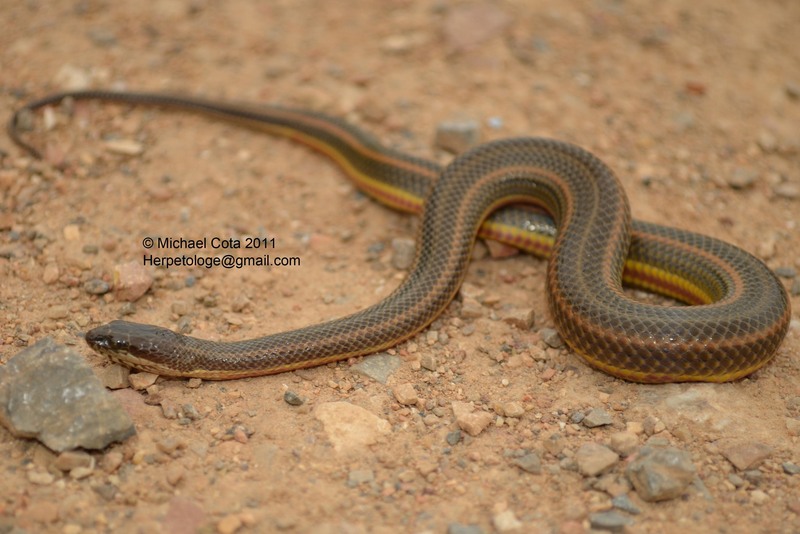 Rainbow Water Snake has a smaller head and has long stripes running down its body. Jagor’s Water Snake is much smaller, lacks bands, and has black blotches on its sides. Yellow-bellied Water Snake is smaller and is uniformly dark above with no pattern. Habitat: Found in swamps, ponds, shallow lakes, rice fields, and other stagnant waters in lowlands. Is highly aquatic and usually stays near water, but will travel over land during rainy nights. Conceals itself among logs in or near water during the day. Danger to humans: Though Bocourt’s Water Snake is a rear-fanged species its venom is not a threat to human. It is not aggressive, but if restrained its large size and sharp teeth allow it to give a nasty, painful bite. Conservation status and threats: There are no known serious threats to its Thai populations. 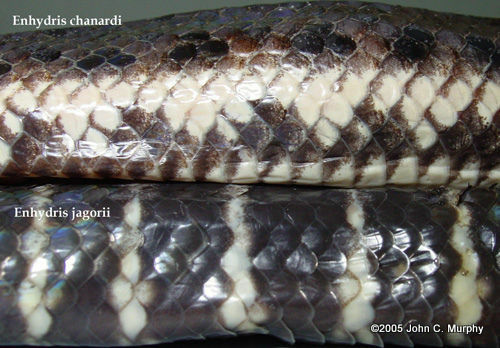 However, Bocourt’s Water Snake is harvested for its meat and skins in several countries. 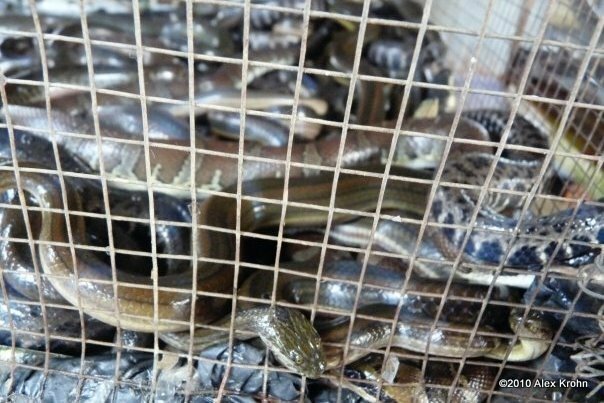 In Cambodia’s Tonle Sap Lake, extended overharvest has led to the species being rarely found and it now comprises only a small proportion of the annual snake catch. There have also been declines due to overharvest in Vietnam. Much of the hunting of snakes in both countries has been constrained, but enforcement is minimal and there are concerns that many snake populations are collapsing. In some areas Bocourt’s Water Snake has begun to be farmed in large numbers, which could relieve pressure on wild populations. Interesting facts: Like many water snakes, Bocourt’s Water Snake releases a foul-smelling musk and feces when handled.